Ecommerce Redsign | Do you need a Ecommerce re-design? It is best practice to re-design your e-commerce site often. This does not mean big changes every time, but rather incremental changes based on the continuing investigation into what your customers want and how they behave. Every now and then however, you may reach a crossroads where you have to consider major changes – even re-platforming. 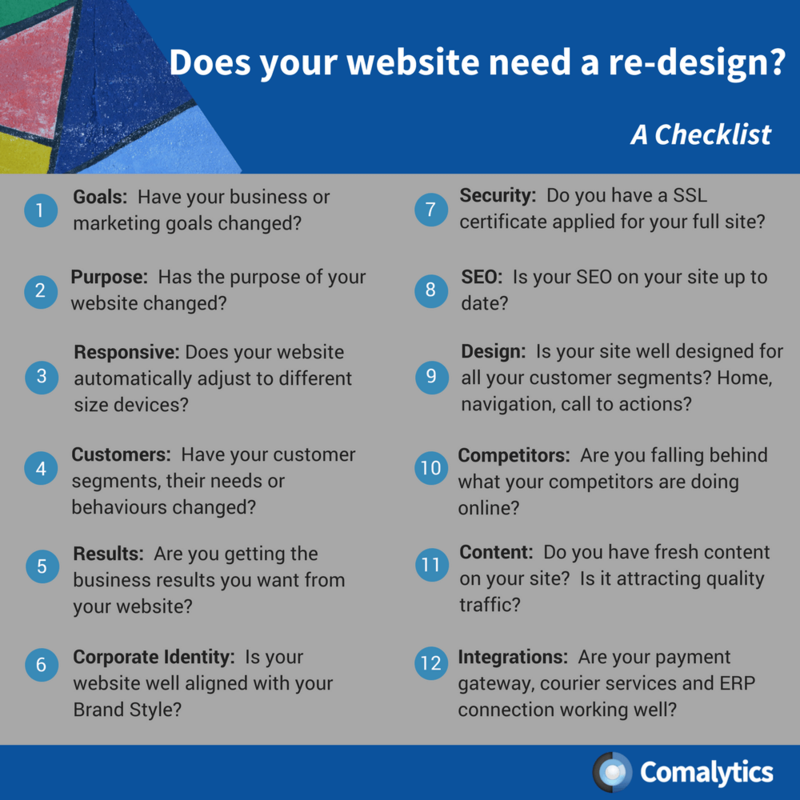 This blog gives you a 12 point checklist to decide whether it is time for a re-design of your e-commerce site. Does your existing e-commerce website need a re-design? Of course, this may imply that you look at your colour scheme, your slogan, logo and your font, but you really have to focus on making your site simple, clean and easy to understand. The customer must feel a natural flow to move forward and convert – with as little as possible barriers in the way. Read more about the 8 Basic ‘must have’ components of an e-commerce site. Below we provide a checklist we re-created from Hubspot, adjusted with Comalytics specifics to help determine if it’s time to re-look at your e-commerce web design. Whether you’re looking for a brand new e-commerce site or a redesign of an existing one, we can help. At Comalytics, our e-commerce web design process takes into account all your available information: from your business and website goals through to your customer segments. We also bear in mind what your competition is doing. How does the e-commerce web design process work? Using the information you provide, we create a ‘floorplan’ for your site, which includes the sitemap, navigation and home page structure. We also suggest additional features that might work for you. Then we use your Brand Style Guide to create a visual design that fits your business and helps you sell more. This year we have re-platformed about 30 customers of which about 15 were re-designs. It is no small feat to say that the transition between the old and new site (including the re-platforming) is seamless. You can read more on one of our customer’s re-platforming experience here. And you can view some of our re-designs here. E-commerce re-design is necessary from time to time. It is important to think about your customer’s needs and changing behaviours as well as your business’ needs and decide to re-design with specific goals in mind – resulting in more traffic, higher conversions or higher Average Order Value. Have you re-designed your site recently? Share with us your insights and tips for going through this process.